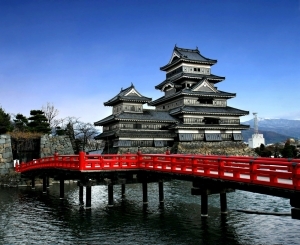 Matsumoto Castle is located in the city of Matsumoto, on the Honshu island. It is one of the most popular ancient buildings of the Land of the Rising Sun. 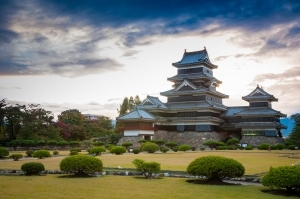 The ancient castle, which was added to the List of National Treasures of Japan in the first half of the 20th century, survived many wars and destructive earthquakes. 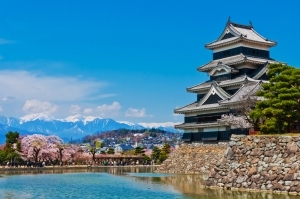 Currently, Matsumoto is one of the most popular tourist destinations in Japan which appeals them not only with its classical architecture but also with various festivals which take place in the summer and autumn. Five-storey castle with finely bent, black roof goes back to the times when the wooden construction on the wetlands was reinforced in 1504. Back in those times, this territory was ruled by samurais of the Ogasawara family but within few decades Matsumoto Castle was conquered by Takeda clan. After endless wars of mighty clans, Matsumoto was taken over by Ishikawa clan in the end of the 16th century. During the reign of this clan, new towers and the main building, which became a central bastion of the castle, were erected. Matsumoto is really popular among the tourists which are willing to see one of the best preserved medieval Japanese castles. The tour begins usually in the main tower Tenshukaku, which means “Lord of Heaven”, which is seemingly a five-storey construction. In fact, there are six floors since the one is hidden between the levels and has no windows. This secret floor is placed on the third level and was designed to store the ammunition and food. On the second floor of the Matsumoto castle there is a museum of weapons where the collection of Michishige and Kayoko Akahane is exhibited . This couple was collecting the exhibits (armors, sharp-edged weapon, firearm and other equipment) for 30 years and in 1991 they gave the collection to the city of Matsumoto. The majority of the exhibits are ready for use since Akahane is an expert in weapons and a member of various organizations and associations in this sphere. Elegant design of the fourth floor, high ceilings and myriad windows indicate that there were private chambers of Matsumoto rulers. The fifth floor is the Samurai Hall. The garrison commanders were meeting there in various times. Windows on this floor are situated in such a way that it is possible to see the whole vicinity of the castle, thus, to coordinate and set the tactics. Spiral stairs, which lead to the sixth floor, connect the Samurai Hall with the panoramic terrace where the ruler was sitting during military operations. The sixth level is 27 meters high so the panoramic terrace is the best place to admire the surroundings. 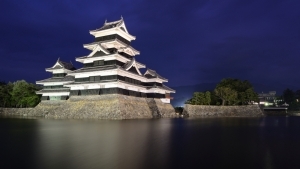 Depending on the season, Matsumoto castle discloses various charms: in the spring, it is awash with cherry blossoms; in the summer, there are many theatre and music plays; in the autumn, it is possible to take part in Autumn Moon Viewing Festival or to admire blossoming chrysanthemums. 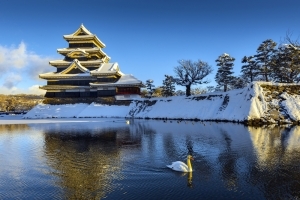 In order to experience something unforgettable, one should go for a walk along the moat, which once was a part of defensive walls and now is a “residence” of graceful swans and carps. The castle is open every day, except for one week of New Year’s break (29th December – 3rd January). Entrance tickets for adults cost 610 Japanese yen, for children – 305. To get to the Matsumoto station, one should take the Tokyo train, and then stroll to the castle.